Doing good leads to feeling good, as everyone knows. Sometimes, it’s easy to do good without even trying! Shopping for a cause can be a yearround activity, not just when the holidays approach. That’s especially true when the shopping is for necessities and the donations are free to the shopper! Through Amazon.com the AmazonSmile Foundation donates 0.5% of eligible purchases to Haiti Air Ambulance, the first and only helicopter emergency service in the country of Haiti. Donations earned through AmazonSmile will fund the unique services Haiti Air Ambulance provides. It could be flying an injured tourist from a beach vacation to Port-au-Prince, the capital city. It might be flying a pregnant mother entering into labor early. Or a missionary in Haiti suffering a stroke who needs medevac to a Dominican Republic partner hospital. Or a burn patient in the countryside who needs to get to the city for transport back to the United States. HAA, the US-based 501(c)(3) that provides vital life-saving emergency medical care makes history daily by flying exactly these types of missions. HAA’s revenue-driving model ensures our sustainability, but we also rely on donations to provide care for those who cannot afford it. As part of meeting our mission, HAA trains Haitians to work alongside American personnel with decades of experience to perform this life-saving medevac service in Haiti. Like Claudel Gedeon, who recently became one of HAA’s first three Haitians to successfully earn certification as an Internationally Registered Flight EMT-B. As part of his training, Claudel traveled to the United States. He explained how his experience riding with the team at the Carilion Clinic Life-Guard program in Virginia was a great opportunity to gain insights into U.S.-based HEMS standards. 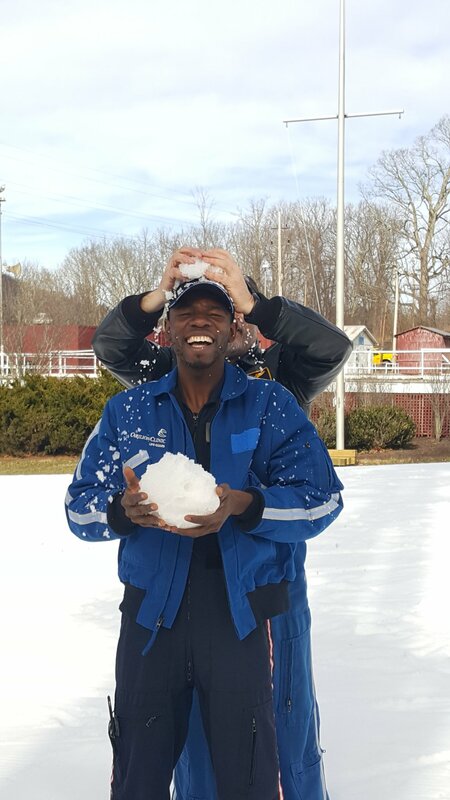 You can help Claudel and his fellow Haitian trainees continue to develop their life-saving skills, and maybe even touch snow. By doing your regular Amazon shopping through AmazonSmile, every penny counts towards the ability to send more of our Haitian crew to the United States to gain memorable experiences like Claudel’s. It’s as simple as signing onto smile.amazon.com and choosing Haiti Air Ambulance as your charity. After making Haiti Air Ambulance your organization of choice, each time you log onto smile.amazon.com (rather than Amazon.com), Haiti Air Ambulance will receive the donations generated by your purchases! There is no additional cost to you, just the added benefit to help HAA save lives while making your regular online purchases. As you continue shopping for a cause throughout the year, HAA will use the donations from your AmazonSmile purchases to continue saving lives in Haiti—the ultimate cause.